トップ > English > What is Honkaku Shochu? According to the Liquor Tax Act of Japan, alcoholic beverages are divided into four categories: 1. Fermented alcohol, 2. Carbonated alcohol, 3. Distilled alcohol and 4. Mixed alcohol. Honkaku shochu is a distilled alcoholic beverage and is also known as otsurui shochu or single-distilled shochu. Currently, 49 ingredients, including potato, barley, rice and other cereals are allowed to be used for Honkaku shochu. Generally, Honkaku shochu refers to the distilled alcoholic beverage made after fermenting these ingredients with koji mold spores and yeast, and after distillation in a pot still. The geographical identification “Satsuma Shochu” designation on the label is allowed for those Honkaku Shochu that are completely sourced and produced in Satsuma (present day Kagoshima Prefecture). This means that all of the sweet potatoes and water must be from Kagoshima. Furthermore, they must be distilled in a pot still and bottled in Kagoshima prefecture. The design of the logo depicts a kurojoka, which is a traditional Shochu server, and a Satsuma style cup. 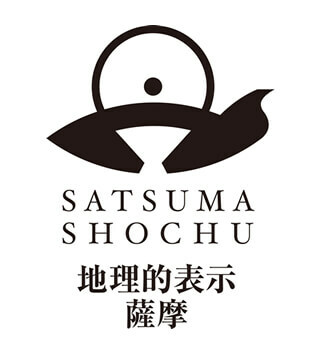 This logo is for exclusive labeling of those products designated as Satsuma Shochu. How is Honkaku Shochu made? 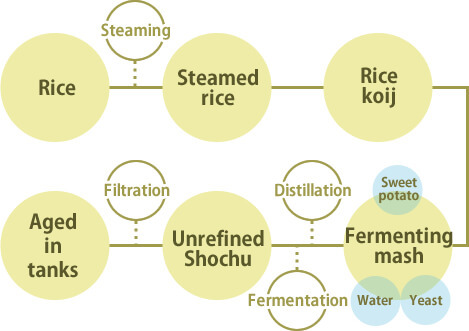 The three important processes in Honkaku Shochu making are “Seigiku (koji preparation)”, “fermentation (saccharification and alcohol fermentation)”, and “distillation.” In the process of “Seigiku“, ingredients such as rice and barley are steamed and microorganism called “koji mold spores” are sprinkled over the steamed ingredients. This process, which is conducted in a temperature and humidity controlled environment, produces “koji mold” by propagating koji mold spores. The koji mold used for producing Honkaku Shochu generates the enzymes necessary for saccharification and it also prevents deterioration of the fermenting mash by generating citric acid. In the process of “fermentation,” saccharification and alcohol fermentation occur. Saccharification means that starch ingredients such as rice and potatoes are dissolved into glucose with the power of the enzyme generated by koji mold. Alcohol fermentation means that glucose is converted into alcohol by using a microorganism known as kobo or yeast. As yeast generates flavor compounds related to taste and aroma, it has a great impact on Shochu quality. Distillation is a process to recover generated alcohol. A pot still is used in the production of Honkaku Shochu. Different methods of atmospheric or vacuum distillation produce unrefined Shochu with various liquor qualities. Here is an example of how we produce common Imo Shochu. First, koji mold spores are sprinkled over steamed rice. While controlling the temperature and humidity, rice koji mold is made. Next, rice koji mold is mixed with water and yeast to go through the first stage fermentation (first moromi fermentation). The most important purpose of this process is to help in the healthy propagation of yeast, which is required to ferment alcohol. After the first moromi has been fermented for approximately 6 days, it is then mixed with the main ingredient, sweet potatoes, and water to begin the second stage fermentation (second moromi fermentation). After approximately 9 days of fermentation, the second moromi is then distilled to produce unrefined Shochu. The unrefined Shochu is then matured and stored. Then it is blended or mixed with water before becoming Shochu for sale. How is Shochu different from Seishu (sake)? Seishu (Sake) is classified as a “fermented alcoholic beverage”, and Shochu as a “distilled alcoholic beverage.” The biggest difference between the two is whether there is a distillation process or not. Seishu is produced after squeezing fermented moromi. This is a “fermented alcoholic beverage” that does not go through a distillation process. In contrast, Shochu is a “distilled alcoholic beverage”, which is produced after distilling the fermented moromi. Shochu has a higher alcoholic content and has almost no sugar content or extract content. 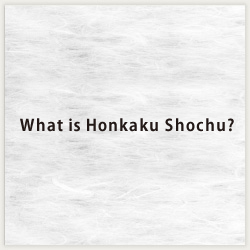 How is Honkaku Shochu different from other distilled alcoholic beverages of the world? The use of koji mold spores during the process is unique to Shochu. Especially during the course of the history of making Shochu, the technique of using kuro koji mold and its variant, shiro koji mold, has been developed. For saccharification of whisky, which uses barley and corn as its ingredients, malt is used. Rhizopus is used to saccharize Chinese alcohol called baiju. The koji mold spores used in producing Shochu is a kind of mold classified as Aspergillus, which forms spores. The color differs depending on the variety of koji mold spores. Kuro koji mold has a black color, shiro koji mold has a white color and Ki koji mold has a yellow color (see photo below). These koji mold spores are sprinkled over steamed rice and are propagated into the rice to make rice koji mold. Ki koji mold is used to produce seishu (sake). It was once used to produce Shochu in the past. However, due to the mild climate of southern Kyushu, other bacteria propagate, which resulted in the frequent deterioration of moromi when ki koji mold was used. Therefore, to enable the stable production of Shochu in southern Kyushu, kuro koji mold and shiro koji mold came to be used. These two koji molds generate citric acid, which lowers the pH value of moromi and limits bacteria propagation. Furthermore, these koji mold spores match Shochu production because the shochu aroma will not be lost as citric acid does not volatilize after distillation. Kuro koji mold is used to produce Awamori and also came to be used widely in Shochu production. Later, shiro koji mold, a variant of kuro koji mold, was discovered. Because of its good stain-resistant feature, shiro koji mold has replaced kuro koji mold and become more prevalent. However, in recent years, Shochu made of kuro koji mold has become popular again and many Shochu using kuro koji mold are now being produced. In addition, we produce Shochu using Ogon koji mold at Satsuma Kinzan Distillery. Ogon koji mold was discovered and separated by Dr. Ryoji Nakazawa in 1911 at Governor-General of Taiwan Central Research Institute. Hamadasyuzou Company discovered that this type of koji mold spores had been preserved at Tokyo University, and now we have succeeded in using it in our Shochu production. The Shochu made with Ogon koji mold is featured by its brilliant flavor with cool and fresh sensation as well as rich taste. What is the best way to enjoy Shochu? There are various ways to enjoy Shochu: On the rocks, mixed with water, mixed with hot water, warmed or straight. Put ice into a glass and pour Shochu in. When you mix it with water, add water at the end. Why not use mineral water or crushed ice? You can enjoy the cool and fresh feeling in your throat. First, fill the glass with hot water to the 2/5 point, and then pour in the Shochu. The standard mixing ratio is 6:4 (Shochu to hot water). You can choose your favorite ratio and temperature, but it is of course a matter of taste as to what ratio is chosen. As the fragrance rises, you will apprehend the essence of Satsuma. Mix Shochu with water as you like, and let it sit for one to two days. Then warm it up. Letting Shochu sit for some time is believed to enhance the tastiness. A special vessel called a kurojoka can be used for warming Shochu. Nothing will be added. Just enjoy Shochu straight. This is the oldest record regarding Shochu. In 1559, the writing of a carpenter was found at Koriyamahachiman shrine of Okuchi City. While he was working on the renovation of the shrine, his master never allowed him to drink Shochu. His complaints and resentments were written on the ridge beam and still remain there. This is the oldest writing of the words of “Shochu” in Japan. Kagoshima prefecture is located at the southernmost part of the Japanese mainland. It was home to Saigo Takamori, a historic hero who was active during the Meiji Restoration. Kagoshima includes Yakushima, which is known as a World Natural Heritage Site, and other natural spots. It is also rich in culture and history. 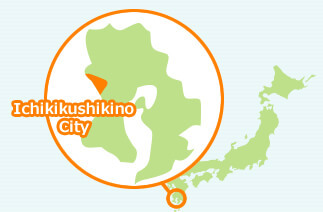 Ichikikushikino City faces the East China Sea and also has abundant nature such as oceans, mountains and rivers. It is a city of food. It is a home port for tuna pelagic fishery cooperatives. It is where Satsuma-age (deep fried fish cakes) originated. It is also the home of agricultural produce such as stockbreeding products and a citrus fruit known as the ponkan. Ichikikushikino City serves as a Food Base.Ichikikushikino City has long been known as one of the most famous production sites of Shochu in Kagoshima. There are many distilleries located here. During the Edo period, our city flourished as a lodging town for Sankinkotai (alternate year attendance of local lords to the Shogun). This commercial city also served as a sea and land hub of transportation. Because of this background, rice was stored here, which was rare in those days. There was also good ground water and abundant sweet potatoes. All three elements of Shochu – sweet potatoes, rice and water – were found here. It is said that it is natural that Shochu making became popular here. Currently, there are six distilleries in the vicinity producing tasty Shochu.